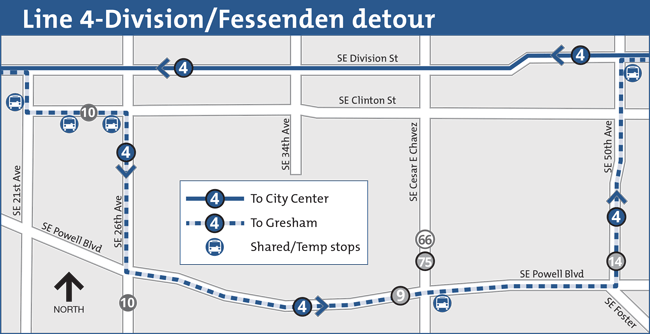 Starting the week of August 25, TriMet Bus Line 4-Division/Fessenden will detour around City of Portland construction on SE Division Street. From 7 a.m. to 7 p.m., Monday through Friday, Eastbound Line 4 buses will be detoured onto Powell Blvd, between SE 21st and SE 50th Avenues. Westbound Line 4 buses will remain on SE Division Street. The City Streetscape construction project will update the streetscape design on SE Division including building curb extensions for bus stops, adding new crosswalks and streetlights, improving signals and installing public art. The city will also complete stormwater and sewer improvements and repave SE Division. Construction is scheduled to last three to four weeks and the work area limits are from SE 26th Avenue to Cesar E. Chavez Boulevard. Detoured from 7 a.m. to 7 p.m. on weekdays only. Eastbound buses will detour off SE Division Street from SE 21st to SE 50th avenues. During all other hours, including all day Saturdays and Sundays, Line 4 will use its regular route on SE Division Street for trips toward Gresham Transit Center. Buses will use SE Division Street at all times. Some stops will be closed in this direction. Watch for signage and postings. Riders may experience delays up to 15 minutes during the detour. For trip planning assistance visit trimet.org or call 503-238-RIDE (7433), Monday–Friday, 8:30 a.m. to 4:30 p.m.